Mortgage Refinancing: The Overlooked Mistakes You Want to Avoid! Mortgage refinancing can be a true life saver when done correctly and at the right time. Making your monthly mortgage payment smaller will free up cash that can be used for other monthly expenses or be put in savings. But before you are lured by the smaller mortgage payments and interest rates, you must be sure that you understand how refinancing works. Understanding this process is the only way in which you can make sure that you avoid making mistakes that will cost you time and money. Refinancing is expensive and it comes with considerable risk, especially for those who are first time home owners and for those that are refinancing for the first time. The most important thing when refinancing is finding out if the new loan is truly saving you money. Taking refinancing costs into consideration is very important when comparing your current loan to the new loan. Another important thing to consider is how long you plan on living in your home. In order to cover the cost of refinancing, you will have to live in your home for two or more years. 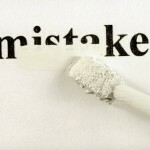 Making a mistake when refinancing is very easy and you will end up regretting making the decision to refinance. But do everything by the book and refinancing will prove to be exactly what you needed to make your life easier. Here is a list of the mistakes that you want to avoid making when refinancing. In rare cases, refinancing multiple times makes sense, especially if it is done over the course of a few years. But most of the time, if done very often, refinancing multiple times will result in losing money instead of saving it. Low interest rates are attractive for everyone, and most home owners will give refinancing a thought when interest rates are near record lows. Home owners who have recently refinanced might get the idea that they will save even more money if they refinance again, because the rates are so low. Unfortunately, refinancing is expensive, costing up to 6 percent of the loan amount. Saving enough in interest for the closing costs to be covered is unlikely if you recently did another refinance. This means that your loan balance will increase, negating the savings that refinancing should bring, making you lose money. It is recommended that you don’t refinance before recuperating the closing costs from your last refinance. Lenders are always competing with each other, so shopping around for a refinance is a smart thing to do. Even if the first loan that you are offered has a low interest rate, good terms, and seems like exactly what you’re looking for, you still have the option of contacting other lenders. By comparing mortgage lenders and what they are offering, you could save thousands of dollars. If you have a good relationship with your current mortgage lender, he might offer you a good deal on refinancing. Even if that is the case, it doesn’t hurt to take a look at what other lenders are offering. If you are planning on refinancing your mortgage, you need to find out if the savings outweigh the cost of refinancing. Refinancing closing costs involve several fees, some high and some low. Not taking into consideration some of these fees, like the origination fee, which can be a few thousand dollars, can make refinancing more appealing, but there is no way of avoiding this fee. You might think that you are saving money by refinancing when in fact the closing costs will be much higher than the savings you are making by taking out a loan with a lower interest rate. Not locking in your interest rate is like gambling. You hope that the interest rates will go lower before closing, and you end up with a more advantageous rate, but you are aware that there’s a risk that the interest rate will increase, making your payments higher than you anticipated. Not locking in your interest rate is especially dangerous with refinancing, because you have to make sure that refinancing will actually help you save money. If you come to the conclusion that you are, indeed, saving money with the interest rate that your lender is offering, but don’t lock in and the interest rate increases, the whole refinance could become just a waste of time and money (Read: Mortgage Refinancing Guidelines). When refinancing, you are basically resetting the term on your mortgage loan. Your monthly payments will be lower, but you will be paying more in interest, especially because most of the payments go towards the interest when taking out a new mortgage loan. Extending your mortgage loan’s term would be a mistake, and you should aim towards taking out a loan with a term close to what has remained on your current mortgage, or even shorter. Taking precautions before refinancing will help you find out if refinancing is the right step for you, and make sure that the whole process goes smoothly. Your goal is to save money on your mortgage, so avoiding these mistakes should be your top priority when refinancing your mortgage.